No one who has met renowned cellist Yo-Yo Ma will be surprised to find these lines from T.S. Eliot's poem at the end of his remarks on the summer program of the Silk Road Project, for which he is artistic director. The poem is taken from Four Quartets, considered by a number of critics as the most important philosophical poetic cycle of the twentieth century. There are distinct similarities between these two artists. Thomas Stearns Eliot, perhaps like Yo-Yo Ma, was full of contradictions. Eliot, who was born in St. Louis, settled in England and became a British citizen. 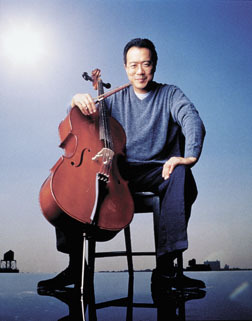 Yo-Yo Ma, the son of Chinese parents, was born in Paris on October 7, 1955. He soon immigrated to the United States and spent most of his youth in New York. He now lives with his wife and two children near Boston. Even though Eliot had always wanted to be a poet, he studied philosophy at Harvard, those hallowed halls where Yo-Yo Ma graduated with a liberal arts degree in 1976 (and where he received an honorary doctorate of music in 1991). Eliot was among the greatest intellectuals of his era, but in his spare time loved to read detective novels and write limericks inspired by his cats. Yo-Yo Ma has never hesitated to navigate the troubled waters of a multiplicity of musical genres, recording with equal ease Bach's legendary Suites for solo cello, Argentinean tangos, folk music of the American West, or film sound tracks. At the moment he is fascinated by Brazilian rhythms, which he discovered through a percussionist with the Silk Road Ensemble--despite the fact that this group's avowed goal is to perform music found along this legendary Eurasian corridor of commercial and cultural exchange. 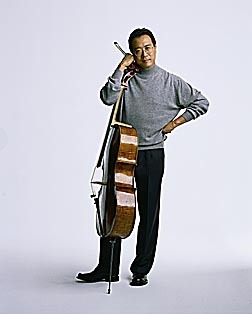 Yo-Yo Ma is always relaxed, whether on the great classical concert stages or in the small classrooms of an elementary school. He rises above technical difficulties and logistical obstacles, stubbornly refusing to accept the status quo. "What I like about the Silk Road Project is its non-static aspect," he says in response to a question about the ground covered by the project since its inception in June1998. "If I had to describe it in two words, I would choose 'creativity' and 'learning,' two things that are never static." These two words seem to have been a leitmotif of his work from the beginning. They depict him perfectly, despite his musical superstar status in all genres. "The best journey is the one not yet accomplished." The creative phase of the monumental Silk Road Project began four years ago when an exchange group was formed, made up of musicians and composers from Asia, Europe, and North America. Yo-Yo Ma remains the core of this group. "For me, the most exciting part of a project is the research and development phase--the mental energy generated and the pleasure of discovery when research enables you to realize the original concept. You think about the concept, considering various ways of giving it shape, but nothing is yet definite, you can float freely, dream. I call it my 'smog' phase." Yegor Dyachkov agrees. He is the young cellist working with the project (although not with these sections of the tour). "He likes to juggle with a number of ideas and work them out as far as they'll go." The project has an advisory group made up of ethno-musicologists, musicians, composers, and members of various collaborating organizations. In July 1999 this group looked at the work of some forty composers, subsequently commissioning compositions by sixteen of them. These were all performed in workshops given at Tanglewood in July 2000. Ma invited Yegor Dyachkov to take part in this musical laboratory. Dyachkov remembers it as an extremely positive experience "that opened my mind to other realities." What really bowled him over, however, was Ma's great openness of spirit. "Everyone could go up and talk to him," he says. "I was very surprised to discover someone so open to what was happening around him. He always listens to you and never puts up barriers." Several of the commissioned works were chosen for the Silk Road Ensemble tour--but not before Yo-Yo Ma had met various experts who provided background on the many special features of the music and instruments of different countries. "No one person is an expert in everything. You have to widen your basic knowledge in order to make a fairly reasonable decision," he says by way of justification. Contributors to this apprenticeship included university specialists such as musicologist and project director Theodore Levin, as well as the musicians of the ensemble. "We have exceptionally gifted musicians who are experts in their field but who are also very open and ready to learn from others," Ma explains. They bond in the course of rehearsals, concerts, and time spent in buses or airplanes. "It's a tightly-knit group. We've developed a way of working and thinking that seems right for everybody. We're constantly evolving. As we get to know one another better, develop greater confidence in each other, and a better understanding of our different traditions, we inevitably establish deeper personal and musical relationships. This takes us to new heights and gives us greater knowledge." These closely woven relationships give Ma an insight into the realities of daily life for people in other lands. He says that now when he reads newspaper accounts of hard Mongolian winters that threaten the inhabitants' lives, he doesn't turn the page to get to the arts section quickly. Rather, he remembers his discussions with Mongolian singer Ganbaatar Khongorzul. "It puts a human face to places that are far away," says Ma. "We've got to learn about our neighbours. Too many people make monolithic statements." Byambasuren Sharav, composer of Legend of Herlen, a lively blend of traditional vocal techniques and contemporary sound, says, "The Silk Road Project has helped me gain a new sense of belonging to a place--my place --while carrying my musical voice to a distant culture." Yo-Yo Ma adds; "Music is the best way humans have of codifying the internal. We live in a time in which we try to codify everything external. Music allows us to bring together people who are no longer with us, or who live far away, and to find the essence of their being by unravelling the musical process." "What I like about travelling is the surprise of coming home." This instinct for clearing virgin territory is something Ma is very keen to transmit to the younger generation. A great deal of preparation has gone into a free online guide for teachers who want to follow the Silk Road with their elementary or high school students. Geography, history, poetry, music, and the various arts are there, complementing each other and providing an exciting portrait of what life is like in other countries. "There's nothing more important than getting young people enthusiastic through a cultural work connected with our world," says Ma, himself enthusiastic as he talks. It's easy to imagine him on his travels, sitting in the middle of a group of young children and, in a pleasant and simple way, telling them about his life as a musician. He also gives sound advice during masterclasses in both top-ranking conservatories and lesser-known schools. Each summer, he spends time at Tanglewood communicating his enthusiasm to young professionals. He doesn't hesitate to appear in shows for youngsters such as Sesame Street or to act as a guinea pig for Wynton Marsalis on the latter's PBS music series. Yo-Yo Ma laughs as he recalls his own youth, although it was somewhat atypical. "I thought I was indestructible!" he says. This from the man who discovered the cello at the age of four, after a hesitant start on the violin (he wanted a bigger instrument!). As his first piece, he set to work on Bach's Suites for solo cello, bar by bar, under the patient supervision of his musicologist father and his mezzo-soprano mother. "He has enormous gifts and true inspiration," says Yegor Dyachkov. Ma's incredible agility and exceptional ability to relax in his mastery of the cello have earned him the keys to the world's cities. He gave his first recital at the age of five, moved to New York to study with Leonard Rose at the Juilliard School of Music at nine (the same year as his first recital in Carnegie Hall! ), won first prize at the Avery Fisher Competition in 1978, and has performed with the greatest orchestras, worked with the best chamber groups, and made numerous prize-winning recordings. Yet Ma says today that the years spent at Harvard, far more than those at Juilliard, were what shaped his personality. The enthusiasm of the other students, delighted to discover unknown new worlds, contributed far more to his development. "I think the most incredible thing in the teenage years is that you're always discovering music for the first time. Everything is so exciting, everything is taken to the max, when you're feeling good. When things aren't going so well, then you're really down. To be able to navigate through all the excitement of discovery, to focus your extraordinary passions on actions that will last a lifetime--this is the greatest challenge of all. It's as though you were building your own cultural structure, choosing the best bricks, and being able to change and adapt it throughout life." "The traveller must knock at all doors before finding his own." Yo-Yo Ma is aware of the depressing statistics of the greying and shrinking number of classical music lovers, and worries about the number of orchestras obliged to seek bankruptcy protection. But even so, he maintains that the cultural machine must be integrated into economic and political spheres. "I keep discovering pockets of people that get involved in fantastic ways," he says with satisfaction. "If reality changes, isn't it a perfect occasion for rethinking the situation and providing renewed energy? We have so many examples of traditions that are continually being revived; I can't help thinking that we have a perfect opportunity for change. We have contradictory definitions of classical music. Nobody knows what it is--or at least everyone has a different view of it." Rather than harping on the differences among various types of music, Yo-Yo Ma believes that we would all benefit by finding a common ground, a single currency that would unify the different factions. "I believe the question should really be, 'What are the components of one type of classical music?' --because there are so many types. Is it only the music of dead, white, European, male composers?" he asks, bursting into laughter. "In that case, classical music is dead! But this isn't the case. We have to find out where the new shoots are coming from, who are the people with interesting ideas and who are discovering new things. If you look at the subject like this, you'll find incredible growth everywhere. It's up to you to sow the seed, to nurture the new shoots so they won't be destroyed, and to find out how to transmit this knowledge to others." "The true voyager is he who never tries to turn back." On the road to self-knowledge, Yo-Yo Ma is always stopping here and there. "The most marvellous aspect of travelling is the way people welcome you into their homes, and how they share their stories, their most precious things with you. Sometimes the best way to return the favour is to pass it on. For Ma, the best way of handing on this bit of life will always be through music, as long as his apparently inexhaustible energy holds out. The Silk Road Project will probably continue with members of "the next cultural generation," as Ma likes to call his young colleagues. However, once he has travelled the road, he will no doubt plunge unhesitatingly into another exploration, gradually convincing his admirers of the worth of his destination. 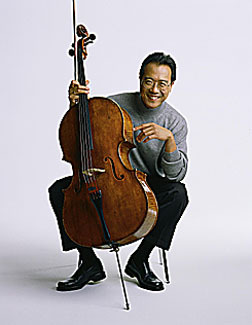 Happy the man who, like Yo-Yo Ma, continues to have a good journey. 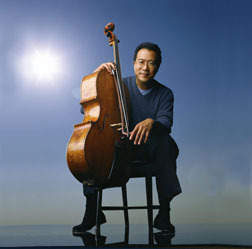 Yo-Yo Ma and the Silk Road Ensemble will be in Toronto January 4, 5 and 7, 2003. On the 7th, he will be the guest soloist of the TSO. Info: (416) 872-4255 (January 4,5) or (416) 598-3375 (January 7).